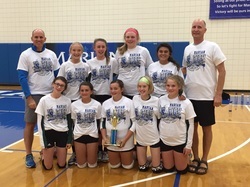 Students in 4th thru 8th grade play in the Parochial (PAL) Volleyball League. Tryouts are held at the end of April prior to the fall season. Practice and games times and locations vary throughout the week and weekends. ​The season runs from early August through October and cost is $75. ​an in-house league one night a week. Fall season runs from August-October and cost is $50.